I've had my sewing confidence rattled lately by the utter failure of my Robe a la Turque, so I'm sorely in need of some hand-holding through a project. Enter the Larkin & Smith English Gown pattern. This pattern comes with paper pieces for the bodice, and a spiral-bound color booklet of history, materials guidance, and step-by-step instruction. It's *fabulous*. I've just started, only cutting out the bodice lining pieces and pleating down the back, but so far it's been very easy and enjoyable, and I truly feel that an excellent gown will result. 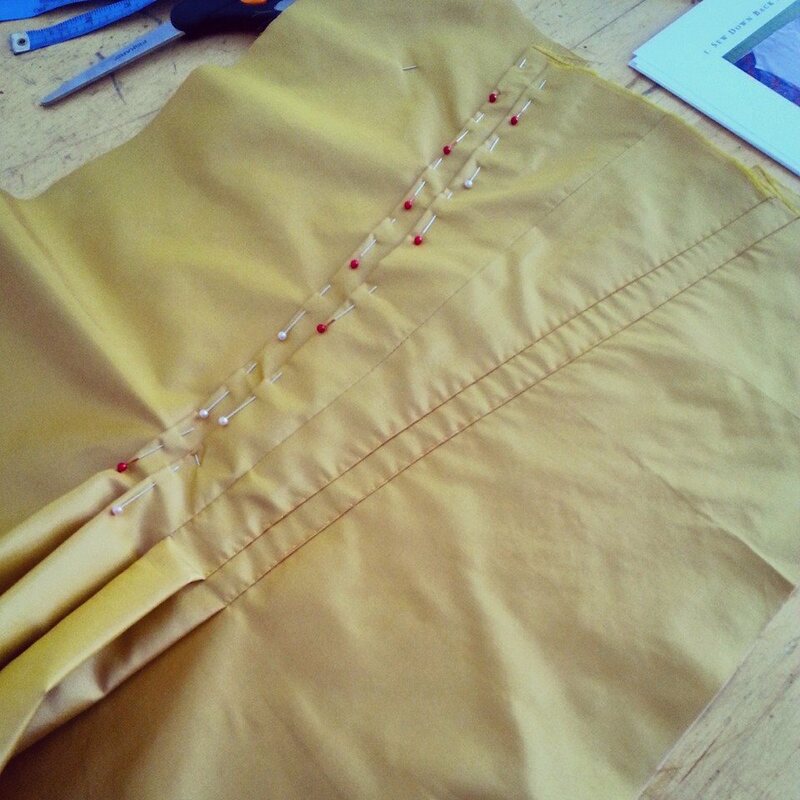 I'm doing the gown up in yellow silk taffeta shot with bronze. 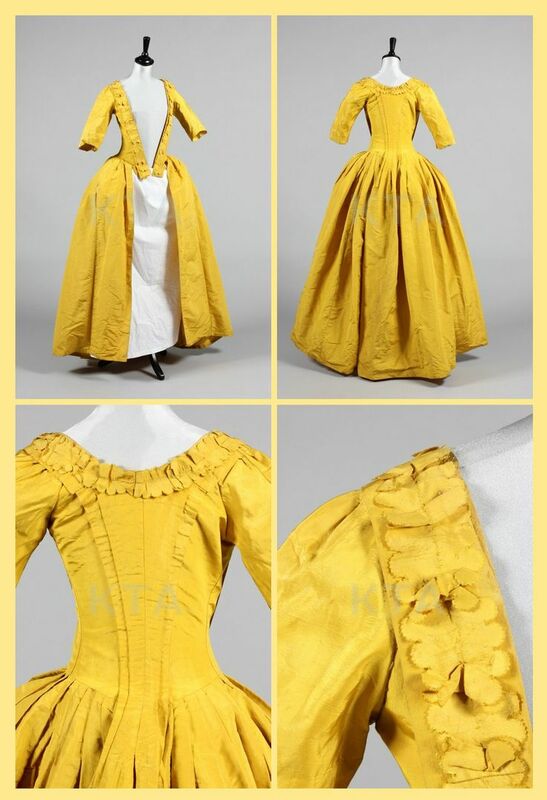 I would have preferred a stronger Chinese yellow, like some of the gowns below, but it didn't seem to be in season. 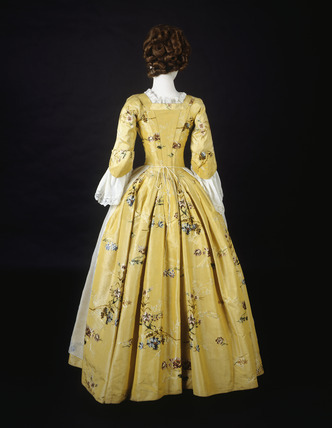 Still, the fabric is gorgeous, and I've wanted an obnoxious yellow gown for so long! 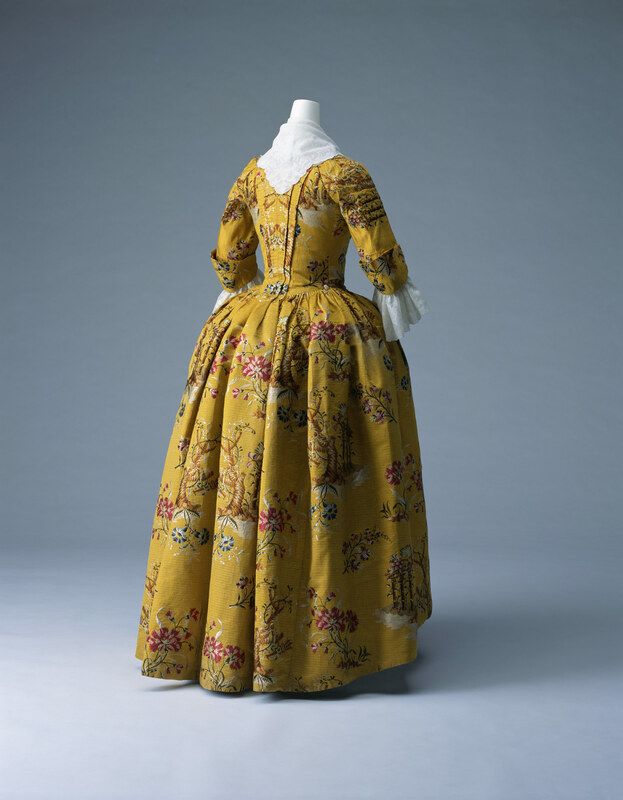 National Trust, 1750-60 - this one has winged cuffs, which the L&S pattern does have as an option. Kerry Taylor Auctions - c. 1770. You can flick through the archives to find this and many others. 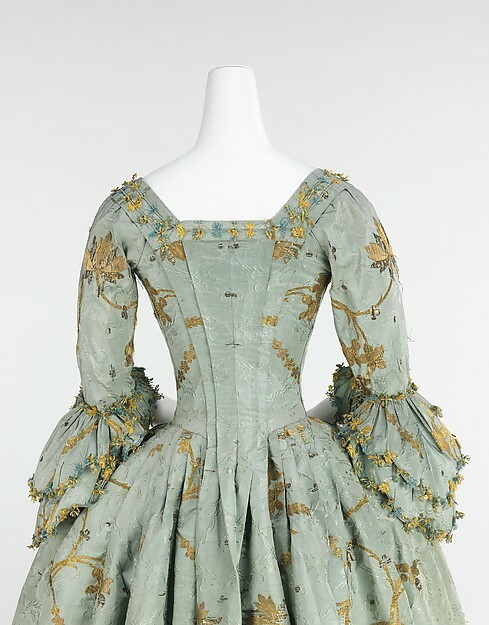 The Met, 1770-75 - isn't that just gorgeous! Crisp pleats and fly fringe. Oh my! That's going to be beautiful!! In fact, it already is!! I love pleats. Oh my sweet baby Jesus, those are absolutely glorious! Especially the last gown. I love the soft, comfortable blue with the bold golden embroidery. I'm sure I'll be dreaming about wearing it for the next several days, Hehe! I've got that pattern too, just need to finish the 1810's and renaissance Italy and then I can get back to the 18th century again. Have the silk already; it's a deep reddish terracotta. I can't wait to see it finished and your yellow too; love the colour. Not this one - the fabric was off-grain and funky. The pattern was OK, but I just need to start again with fresh fabric that doesn't fight me the entire time. Looking forward to your yellow gown! I've been contemplating trying the L&S pattern, myself...though I need another gown like I need another hole in my head. Who am I kidding. I need another gown. I will always need another gown. Yes, we always need new gowns!! It's looking good already! And that pattern sounds amazing! Larkin and Smith patterns are so detailed and fabulous! You pay a little extra for them, but it is so worth it! Your English gown looks gorgeous so far! Thanks! So far it's going well. There are a couple confusing parts, but I figured it out. I can't imagine trying to do this gown as a beginner, without the thorough instructions. When it´s ready, it will look faboulos! Now, I want another english gown too!!! This is looking so pretty! Lmk if I can help virtually on the turque. I'm happy to answer questions or offer advice! I may take you up on that! I think I had a good thing going, but my fabric was all off grain and weird and I was struggling with things that I shouldn't have been having issues with. Awwww, what happened with your Robe a la Turque? Do you think you'll do a write-up on it here? I learn so much from you and other costume bloggers, and am especially happy when I see blog posts about projects that either didn't turn out or took a lot of fiddling with to get right. It makes me feel less incompetent and it's also very instructive! I should do that more with my blog because half of my stuff doesn't turn out. 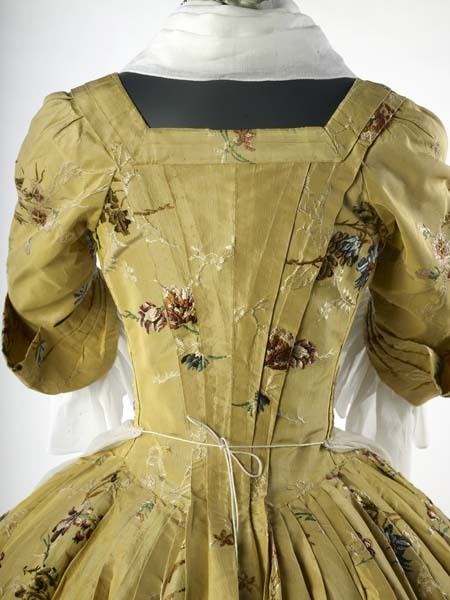 I still haven't made a historical costume yet, so ladies like you are so aspirational to me! On another note, yellow is my favorite color and I am really in love with all those gowns. Can't wait to see how yours continues to shape up! 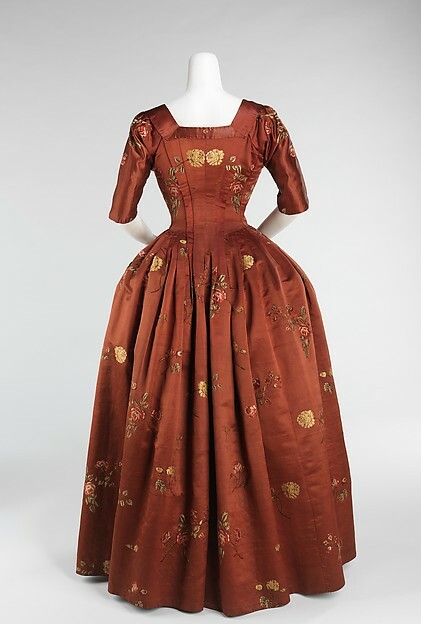 I am also planning on buying the same English Gown pattern once I finish my stays so I'll be interested to read more about your experience with it. Oh so sorry about the Turque! I'll have to go back and read what happened.